Our step-by-step process is easy to follow, making your permit application a breeze! Get yourself prepared BEFORE you visit the RMV. Did you know that motor vehicle accidents are the #1 killer of teens in the United States? In a nationwide effort to combat this eye-opening dilemma, many states have initiated a Graduated Driver Licensing (GDL) program in which first-time drivers must reach certain milestones prior to getting their full driver's license. One of the first steps on your path to your Massachusetts driver's license is to obtain your Mass learner's permit. Below you will find everything you need to know, including detailed information about required documents and some really helpful time savers, such as online practice tests. (857) 368-8000 (From area codes 339, 617, 781, 857 or outside of MA). (800) 858-3926 (From all MA Area Codes not listed above). (877) 768-8833 (For hearing-impaired callers). Your certified driving record MUST NOT be more than 30 days old. NOTE: Massachusetts also accepts permits from Mexico and Canada. The requirements for applying for a MA learner's permit are both age and document-based. You must be at least 16 years old to apply. A completed Driver's License, Learner's Permit or ID Card Application (Form LIC100). If you are under 18 years old, your application must be signed by a parent or legal guardian. Certified copy of a U.S. birth certificate. Any document issued by the RMV. A mortgage or lease documents dated within 60 days. Any state-, federal-, OR municipal-issued documents such as First Class mail. A utility bill, credit card statement, or medical statements dated within 60 days. An Alternative Residency Affidavit (Form LIC111). Payment for the $30 permit application fee. *NOTE: If you want a REAL ID-compatible document in order to board a domestic flight, enter a federal facility, or enter a military base AFTER October 2020, you MUST provide 2 documents proving MA residency. When you have in hand all the required documents mentioned above, it's time to prepare for your knowledge/permit test at your local RMV office. This test is computer-based and will be administered on automated testing stations featuring easy-to-use video screen kiosks. If you have a disability and are unable to use the kiosk, please bring medical documentation of your disability and ask to speak to a branch manager. The test will consist of 25 questions based on information about Massachusetts traffic laws, road signs, and safe driving techniques found in the MA Driver's Manual. You will have 25 minutes to complete the permit test. You'll need to answer 18 questions correctly to pass. You need to pay the $30 fee. 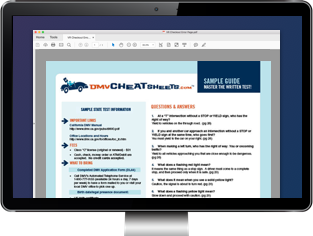 Although the RMV suggests studying the Driver's Manual to prepare for the written test, our suggestion is to study with the help of a comprehensive online practice test from our approved partner. Complete at least 40 hours of supervised practice driving time with a licensed driver 21 years old or older. This driver must have a minimum of 1 year driving experience. If you have completed a driver skills development program, you only need to log 30 hours of practice driving are required. Log your hours on a Supervised Driving Log. Your parent or guardian must also complete 2 hours of instruction as part of your Driver's Ed and training requirements. See our page on Teen Licensing in MA for details. You may only operate a passenger car. You must carry your learner's permit at all times until you get your junior operator's license or a full driver's license. You must always be accompanied by a licensed driver who sits in the passenger seat next to you. This person must be at least 21 years old, have a valid license, and have at least 1 year of driving experience. If you are under 18 years old, you are not allowed to drive between the hours of 12 a.m. and 5 a.m. unless accompanied by a licensed parent or legal guardian in the front seat next to you. If you leave Massachusetts, the state you enter must allow teens with out-of-state learner's permits to operate a vehicle. You lost or unintentionally destroyed your current Class D permit. You changed your name or address. In order to get your duplicate, you must complete a Drivers License Learners Permit or ID Card Application (Form LIC100), bring the required documents mentioned above and pay the $15 fee at the RMV. Once you have your Massachusetts learner's permit, it's time to experience what life is like on the open road. Your next step in the GDL is to complete an approved Driver's Ed course so you can get your junior operator's license (JOL). For more information, please refer to our Massachusetts Teen Driver's License page. RMV application for an original, renewal, replacement OR corrected Class D driver's license, Class M license, learner's permit, OR MA state ID card. Use this form to signify Massachusetts residency if you're a minor. Must be signed by your parent/legal guardian and notarized, or signed in-person at the RMV.